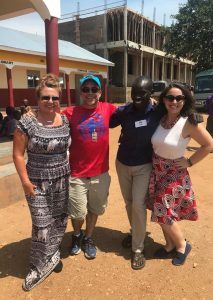 Seven years ago a team of people from across the United States traveled to Nebbi, Uganda to hear of a man’s vision and how he hoped to turn his vision of this thing called “Acres of Hope” into a reality. We stood, holding hands in a circle, as we prayed over this land that Pastor Geoffrey had purchased. We asked God to bless him and the vision by putting the right people in the right places at the right times so that the vision would be fulfilled. The vision was to create a school/child sponsorship program that would become self-sustaining so that orphans in Nebbi and the surrounding areas would be given a shot at breaking the cycle of poverty. At least six trips from our (West United Methodist) end, multiple church partners, a new non-profit Acres of Hope International have brought us to this place. Last night as the team members sat and shared how they’d seen God at work over the past few days, several words kept recurring. From the time we stepped foot in Africa 7 years ago til now, each of those words have been a recurring theme on all ends. Geoffrey’s and ours. opportunity for advancement was few and far between. Sunday evening he stood before us and the words he uttered were life-changing. Not for him, but for us. You see, he shared his life change. He reminded us that he was one of the first people that West sponsored after our first trip here . . . and because of that sponsorship, he was able to go to school, be healthy, have what he needed to grow up and succeed in life. Now, seven years later, he has attended secondary school and graduated and is being trained in the residential/commercial plumbing industry. After he completes this technical education he then has plans to return to Acres of Hope and serve as a plumber as Geoffrey continues the advancement of the AOH organization/structures. He will use his skill so that Geoffrey doesn’t have to hire outside help and truly the gift of love and generosity will come full circle. Last night we talked a lot about sometimes it takes a long time. Geoffrey continually talks to the students about courage and boldness, not being self-conscious so that they can be who God has created them to be. Our team reflected on how in our world of social media, we present ourselves as a highlight reel. We put forth our “best” image, even if often times it is massively filtered so that others won’t see the vulnerabilities we all have. We heard Geoffrey teaching them these lessons. However, from our perspective compared to us, here in Uganda, they are unapologetically authentic. Whether it was as they worshipped, learned, or played with one another, their love for God and each other was apparent. If playing a game and someone fell down, instead of using that weakness to get the win, the game always stopped until they helped each other up again. What would our lives be like if we lived with authentic abandon? If we claimed who we are created to be and lived into that instead of worrying how many likes we get on our social media accounts. Imagine what we would do and how we could change the world. The team members are embracing a “get real” on social media challenge and instead of putting forth filtered highlight reels from the trip, we are going to be real. Maybe it will rub off on our everyday lives and the lessons we’ve learned here will continue.